Update: Pete Ganbarg has (in 2018) been named President of A&R at Atlantic Records. More recently, he has worked closely with the hit rock duo twenty one pilots, and he A&R-d the best selling soundtrack albums for Hamilton and The Greatest Showman. Pete Ganbarg, who heads the A&R department for Atlantic Records, has been one of the most successful A&R execs in the music industry for the past 25 years. Starting in 1989 at SBK Records, Ganbarg has subsequently held top A&R posts at EMI, Arista and Epic, before joining Atlantic as Head of A&R close to six years ago. He has worked with a wide array of hit artists, such as Carlos Santana, Kelly Clarkson, Daughtry, Train, Halestorm, Christina Perri, Icona Pop, Kenny G, Run-D.M.C, Chaka Khan, Aaron Neville and Twenty One Pilots. Ganbarg has also had success running his own company, Pure Tone Music, which has been an A&R consulting and music publishing company. Throughout his career, Ganbarg has been known for his expertise in overseeing hit album projects, which includes selecting songs, working with artists, songwriters and producers, and supervising the album process from beginning to end. In some cases, Ganbarg has worked on major projects which combine the talents of several artists. Perhaps his biggest success was A&R-ing Carlos Santana’s blockbuster 1999 album Supernatural, which has sold 28 million units worldwide. This album featured collaborations between Santana and Rob Thomas of Matchbox Twenty (the smash hit “Smooth”), Wyclef Jean/The Product G&B (the hit “Maria Maria”), plus appearances by Dave Matthews, Eric Clapton, Everlast, Lauryn Hill & CeeLo Green, and Eagle-Eye Cherry. Over the years, Ganbarg has worked with a variety of artists in many genres, ranging from pop, rock, R&B, rap, jazz and country. At SBK Records, his first project was handling A&R for the Teenage Mutant Ninja Turtles soundtrack albums, which included the hit “Turtle Power” by his first signing, Partners In Kryme. He then went on to work with rapper Vanilla Ice on his mega-selling single “Ice Ice Baby” and album To The Extreme, which sold 11 million units. Years later (in 2004), Ganbarg demonstrated his range by A&R-ing a pop/jazz/R&B projects, including Kenny G’s At Last…The Duets Album, which featured performances by Barbra Streisand, Burt Bacharach, Earth Wind & Fire and Chaka Khan, as well as Khan’s 2X-Grammy-winning comeback album Funk This in 2007. Now helming the A&R department for Atlantic Records since 2008, Ganbarg has signed and developed talented new artists, and works with Atlantic’s impressive roster, which includes Ed Sheeran, Bruno Mars, Charli XCX, Halestorm, Christina Perri, Jason Mraz, Paramore, Zac Brown Band, Hunter Hayes, Icona Pop, Matchbox Twenty, CeeLo Green, Flo-Rida, Trey Songz, Switchfoot, and Janelle Monae. 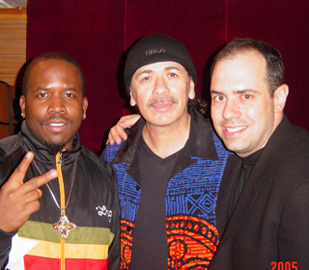 Pictured (l-r): Big Boi of OutKast, Carlos Santana and Pete Ganbarg. 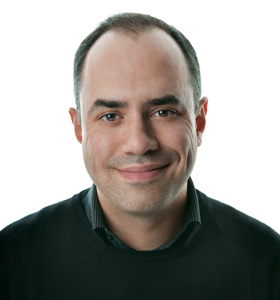 We are pleased to present this special Q&A interview with Pete Ganbarg. He tells how he got started, and discusses many of his hit artist projects. He also talks about his work at Atlantic Records, and offers insights into the current state of the music business. Ganbarg: I started reading Billboard magazine and studying the charts when I was about 13. I noticed I couldn’t hear all the songs yet (because there wasn’t an internet yet), and I realized I needed money to buy a lot of records if I was going to be able to keep up with everything I wanted to hear. So I started a mobile DJ business and used the money to buy a lot of records. I started to analyze the songs I was hearing and, without knowing it, started to teach myself A&R. Then when I went to college (Wesleyan University in Connecticut), I did college radio programming, college booking and management. So by the time I graduated, I had a good amount of music business experience just by jumping in and doing what I loved. DK: After college, how did you get into A&R? Ganbarg: I started promoting records independently right out of college. Then in 1989 I was introduced to Marty Bandier and Charles Koppelman (who owned SBK Records), and they hired me to do entry level A&R. The first project I A&R’d was the very first Teenage Mutant Ninja Turtles soundtrack. We needed a rap song for the main theme, so a group I was developing at the time, Partners In Kryme, came up with a song called “Turtle Power,” which became a hit. Then Charles Koppelman signed Vanilla Ice, and I A&R’d his To The Extreme album. DK: What was it like working with Vanilla Ice during this time? Ganbarg: It was an amazing experience. We did a live album and movie soundtrack, and I was also music supervisor for his film. His To The Extreme album sold 11 million units. He became a superstar so fast, but it all ended just as fast. DK: How many years did you work at SBK Records? Ganbarg: Eight years. SBK got big and eventually merged with EMI, so I also worked for EMI. One of my favorite projects was signing and A&R-ing the group Blessid Union of Souls (who had the hit “I Believe”). I worked for EMI Records until 1997 when the label was shut down. I was 30 at that point. DK: Was it then that you started working for Clive Davis at Arista Records? Ganbarg: Yes. I got an interview with Clive Davis and he hired me to be Senior Director of A&R. The first artist I worked with at Arista was Santana. Clive had the vision to re-sign Carlos (he had signed him 30 years earlier at Columbia, but Carlos hadn’t had a gold album in 15 years) and I jumped in and brought Clive the concept of having several other artists collaborate with Carlos–artists who had grown up being inspired by his music. The album became Supernatural, and it sold 28 million records worldwide. 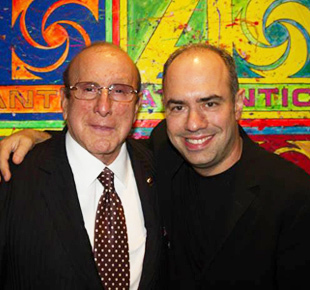 Clive Davis has been my greatest mentor and friend–he’s awesome. I loved working on the Supernatural album–every song was unique and different. DK: What other projects did you work on for Arista during this period? Ganbarg: I really enjoyed working on Run-D.M.C’s album, Crown Royal. I now have a lifelong friendship with Rev (Run). I signed and worked with Shannon Curfman, an amazing young blues/rock artist, and signed the rock band Adema, whose debut album went gold. But then in 2000 Clive Davis was fired at Arista, so six months later I left to become Senior VP of A&R at Epic Records. Epic wasn’t the best fit for me at the time, although during that time I did introduce my friends (writer/producer) John Shanks and Kara DioGuardi to each other, and they became a great hitmaking team. When (CEO) Polly Anthony was fired, a lot of her people went with her as well and I was one of them. DK: So was it then that you decided to launch your own company, Pure Tone Music? Ganbarg: At that point I was ready to try something different. I started Pure Tone Music in the fall of 2003. Pure Tone was conceived as a production company and publishing company. A few months in, we morphed into an A&R consulting company as well and that’s where most of our time and effort ended up going into. I had gotten a call from Clive Davis–he asked me if I would like to A&R some records for him freelance. I then A&R’d the Kenny G duets album, and Santana’s All That I Am album for Arista. For Kenny G’s album, we were able to get Burt Bacharach, Barbra Streisand, Earth Wind & Fire, Yolanda Adams, Chaka Khan, Brian McKnight and Gladys Knight to do duets–it’s still one of my favorite records that I’ve worked on. Earth Wind & Fire did a cover of OutKast’s song “The Way You Move” which turned out great. The ability to really think outside the box and creatively draw on a blank canvas is an amazing opportunity. After we did these albums, I started getting calls from other labels to do the same thing for them. So it was then I worked as an A&R ‘gun for hire’ for most of the label groups including Columbia, Warner Bros., Capitol and Atlantic. It was great–I A&R’d a lot of records. Clive Davis then introduced me to Simon Fuller and Iain Pirie at 19 (Entertainment) and I started to A&R several albums for the American Idol franchise. I A&R’d seven American Idol albums, including albums for Daughtry, Kelly Clarkson, Taylor Hicks, David Cook and Blake Lewis. In 2008, labels started asking me to come back inside full-time. I thought if the right offer came along, I would consider it. Around that time, my good friend (producer) Howard Benson recommended me to Craig Kallman (CEO of Atlantic Records) to A&R an album for the group Halestorm. Craig liked the Halestorm album we did and asked me to run the A&R dept. at Atlantic. I told Craig that I was interested, but that I had four outside A&R projects that I needed to finish. He agreed to let me finish these four outside projects: David Cook, Kelly Clarkson, Daughtry (the Leave This Town album) and Train (Save Me, San Francisco). For the Train album, I put (lead singer/writer) Pat Monahan with the writing/producing duo Espionage (Amund Bjorklund & Espen Lind) and they wrote “Hey Soul Sister”–that was great. All these projects were very song-oriented. DK: It’s clear that labels respect you for A&R-ing albums, finding the hit songs for a project, and/or enabling the artist to co-write the best songs. Ganbarg: Throughout my career I’ve worked mostly on projects and artists which are very song-oriented projects. With each song, I study the structure and lyrics, and work with the songwriters to help them get the right song ready for the appropriate artist’s audience. DK: When did you start working at Atlantic Records? Ganbarg: I started working at Atlantic in October 2008. I oversee the A&R department except for Urban music–I do rock, pop, and I dabble in country. We’ve got a great staff, around a dozen people who work with me. DK: How do you decide which artists to sign? These days, do artists/bands need to be developed and established already before you sign them? Ganbarg: There are no rules in terms of which artists we sign. We’ve signed certain bands who have already built a large following. Or sometimes we’ll sign an artist we just believe in, and start out on the ground floor. Jason Mraz, Shinedown and Paramore are terrific examples of artists who were not established when we signed them, and now they’ve become major artists. DK: Who are some of the artists & bands that you work closely with at Atlantic? Ganbarg: I’m pleased to be working with Christina Perri—her recent single “Human” went platinum; and with (hard rock band) Halestorm—they’ve won a Grammy award (for Best Hard Rock/Metal Performance) and have sold 900,000 album equivalents. I also work with Twenty One Pilots, who are becoming one of the best live bands; and (Swedish duo) Icona Pop—their single “I Love It” was a big hit. I’m also excited about a band called In This Moment which is fronted by singer Maria Brink, who’s a cross between Marilyn Manson and Lady Gaga. 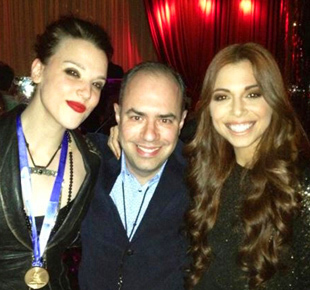 Pictured (l-r): Lzzy Hale of Halestorm, Pete Ganbarg and Christina Perri. Jasmine Thompson from the U.K. is young artist that I’m also excited about. Jasmine did a wonderful cover of Passenger’s “Let Her Go”. Her voice is so unbelievable—she did the video at age 12, and she’s now 13. Her YouTube video of “Let Her Go” has 13 million views. Jasmine also sang a cover of (the Chaka Khan hit) “Ain’t Nobody” which was used in TV advertisement. She’s going to be featured on some exciting, forthcoming projects. DK: As Head of A&R, do you have other duties besides signing and discovering new artists? Ganbarg: Yes. At Atlantic, I wear two hats—signing new artists & making records, and overseeing the A&R department. One of my big priorities is to identity and groom the next generation of A&R executives. I believe A&R people can spot other A&R people a mile away. Doing A&R is a very unique, strange profession and its not for most people. I think you can meet and talk to a person, and you can immediately get an idea if they have the passion and the ear to be a successful A&R. I’m lucky to be working with some of the great young A&R people, all under the age of 25. Stefan Max is one— he’s signed (Australian singer/songwriter) Vance Joy and (indie rock band) Young The Giant. Another of our young A&R execs is Jeff Levin who has an artist named Jaymes Young who he co-manages and brought to Atlantic. I’ve known Jeff since he’s 16 and have worked with him since I met him. A&R exec Brandon Davis is also 25 and used to be my assistant. Brandon is excellent at quarterbacking pop (writing & recording) sessions, and he knows how to find great songs. It’s very fulfilling to work with such young creatively-driven, musically-obsessed people. It’s also great working for (Atlantic co-chairmen) Craig Kallman and Julie Greenwald, who are two of the best music executives I’ve ever met. DK: Are “360” deals now the standard, when signing a new artist? Ganbarg: Labels look to do 360 deals now. What we traditionally did was build an artist’s career, but our only income came from record sales, even though our efforts directly led to an artist generating income from touring, merchandising and other sources. With our new agreements, when we break an artist, we participate in income streams such as touring and merchandising. We have now hired the top pros in merchandising, concert touring, fan clubs, and marketing, etc. So we now have great people in all these fields who can help our artists best achieve their goals all coming from the same place. DK: In closing, is there anything else that you’d like to mention? Ganbarg: I want to say, in terms of doing A&R, that for me it’s always been about the songwriters. The key to success is to have an incredible song performed by an unbelievable artist. If you have a great artist with mediocre songs, or if you have great songs but with a mediocre artist, it usually won’t work. So it’s always going to come down to those who are creating the songs. I often get more excited about discovering a great new songwriter than a band. A band is one entity that can turn into a massive success. But a songwriter can write for everyone.